Impacts of a range of policy scenarios on end-use energy demand are examined using a coupling of MARKAL, an energy system model with extensive supply and end-use technological detail, and Inforum LIFT, a large-scale model of the U.S. economy with inter-industry, government, and consumer behavioral dynamics. Responses in end-use energy demand are the result of energy efficiency improvements, fuel switching, and indirect economy-wide impacts. Carbon emissions reductions attributed to end-use demand response are analyzed and compared to carbon emissions reductions attributed to changes in the electric sector. Scenarios with the greatest impacts are a carbon tax case, resulting in a shift away from coal generation in the electric sector, and a normative case using a 7% discount rate for end-use technology investment decisions, resulting in increased adoption of energy efficient technology. In the course of addressing the specific EMF 25 scenarios and specified assumptions, a number of interesting issues were identified for follow-on analyses. 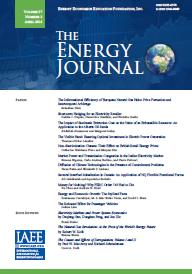 Published in Volume 32, Special Issue of The Quarterly Journal of the IAEE's Energy Economics Education Foundation.